The New York Times has launched a new daily video feature on NYTimes.com. TimesCast, which is available on the newspaper’s homepage between 1:00pm and 2:00pm EST Monday to Friday, falls somewhere between an ordinary television news broadcast and a short behind-the-scenes documentary. 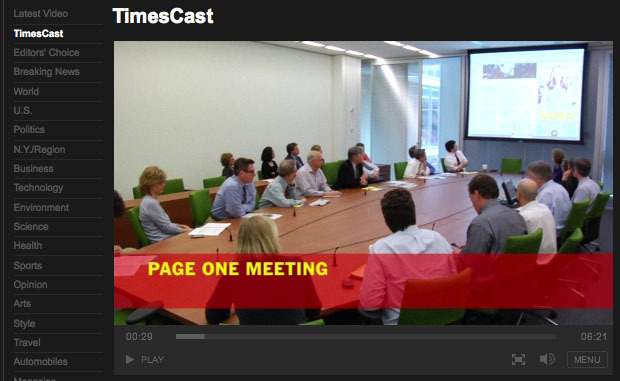 Viewers see segments of the daily page one meeting, followed by various reporters and editors in conversation about stories they are working on. Previous days’ episodes will be available via the Times’ online video section. Follow this link to see the first TimesCast episode in full. “This is another example of our continuing emphasis on video, which represents one of the largest growth areas in digital media,” said Denise Warren, senior vice president and chief advertising officer, The New York Times Media Group and general manager, NYTimes.com. Last December the Times launched TimesSkimmer, a new format for organising online content that allows users greater control over layout. This entry was posted in Editors' pick, Multimedia, Newspapers, Online Journalism and tagged multimedia, New York Times, NYT, timescast, timesskimmer, Video, vodcast on March 23, 2010 by Joel Gunter.